Facebook, Amazon, Apple, Microsoft, Google, Baidu, Alibaba, and Tencent are worth $US5 trillion, according to data compiled by Bank of America Merrill Lynch. US tech stocks are worth even more, at a $US6.6 trillion market cap. 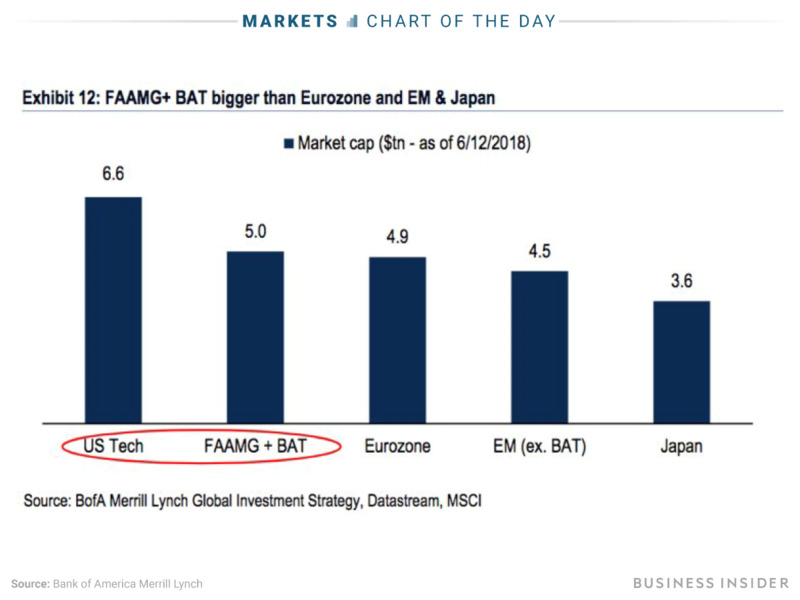 The companies make up what Wall Street has abbreviated as “FAAMG + BAT”: Facebook, Amazon, Apple, Microsoft and Google(or Alphabet), plus the Chinese tech companies Baidu, Alibaba, and Tencent. As of last Tuesday, they had a combined market capitalisation of $US5 trillion, according to data compiled by Bank of America Merrill Lynch. US tech stocks were worth even more, at $US6.6 trillion. This ballooning in size has led to concern that investors are too optimistic about the future earnings power of big tech companies. BAML’s monthly survey of fund managers around the world shows that for most of the past year, the “most crowded trade” has been betting on tech stocks. A recent survey found that it was thought to be “long FAANG + BAT,” while “long Nasdaq” became a concern in the second half of last year. The most crowded trade was briefly “long bitcoin” just before the cryptocurrency peaked above $US19,000 in December. Without declaring that we’re seeing another tech bubble, Michael Hartnett, the chief investment strategist at BAML who published the chart above, recently listed this “fat” market cap stat as one of 10 reasons investors should be pulling money out of tech stocks. Indeed, no sector dominates global stock markets like tech does. The MSCI USA Index of over 600 companies is driven by technology companies, which make up 27% of it. And on the top-10 list of the largest companies in the world, Berkshire Hathaway and Exxon are the only outliers, sector-wise. Tech comes out on top in other ways you could slice the data, particularly in the US. But it’s the near uniformity in opinions on big tech stocks that could continue to reap gains for investors – or catch them off guard. Only five of 199 analyst ratings on FAAMG stocks say “sell,” according to Bloomberg data. There are no “sell” recommendations for Apple or Alphabet.